Cloudteh Review 2019: Is Cloudteh a Good Hosting? Cloudteh offers quality shared cloud hosting, cloud server, Linux VPS, and dedicated hosting plans at reasonable prices. In business since 2016, Cloudteh provides high-quality hosting using premium technologies. With its servers in the United States and France, it offers cloud web hosting, VPS, servers, and dedicated servers. The website is in English. The servers are powered with LiteSpeed, which accelerates their speed, enabling your website to handle more visitors at the same time. Another feature that makes the performance of the servers better is the use of SSD NVMe. These drives use a faster hardware interface than the regular SSD, delivering better performance, security, and website load time. I like the attention to data security as well. In addition to the daily backups, it uses RAID protection to copy customers’ data into multiple physical storage units. That way, if one has issues, your data remains safe in the others. It also offers advanced DDoS protection for all attacks up to 600 Gbps. All in all, I would say the security is one upside that you might not want to overlook. Along with everything mentioned, it uses CloudLinux, which adds another measure of security and stability. Beginners to web hosting can use Softaculous in their cPanel to install applications. However, there’s no free website builder. Customers will have to handle website development themselves and pay for the available site builder on offer, or get more experienced hands to do that. Cloudteh’s prices are low-cost, especially for the resources on offer. The tools, quality, and security rivals many of the popular web hosts. It also doesn’t try to lock customers into long-term contracts, allowing them to pay monthly, quarterly, or semi-annually. It also offers annual, biennial, and triennial plans. Although there’s no free plan or trial, the 30-day money-back guarantee allays the fears of customers, given that you can get a refund if you decide the Cloudteh service isn’t for you. Customers can contact Cloudteh customer support 24/7 through online ticket, live chat, and email. It claims to respond within 24 hours, and when I used the live chat, I got connected to a representative within five minutes. 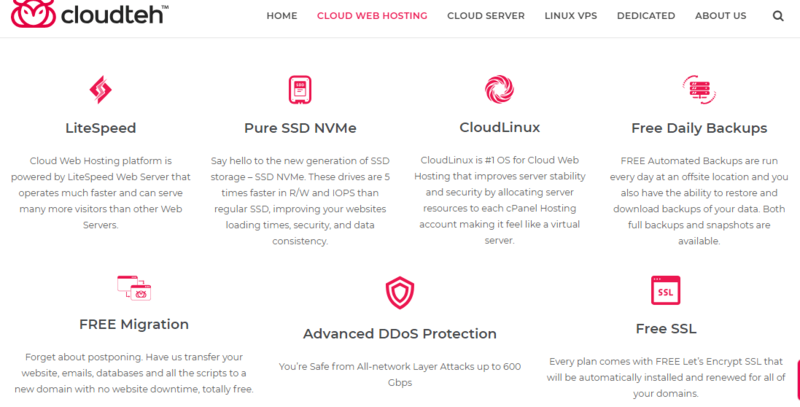 If you’re looking for a web host with a presence in the U.S., Canada, or France, Cloudteh is a good one to consider. It uses premium tools and offers reasonable prices. However, it hasn’t been in the business for so long, so the experience might not be vast. Wondering how Cloudteh stacks up against other Web Hosting companies? Enter any other Web Hosting company and we will give you a side-by-side comparison.